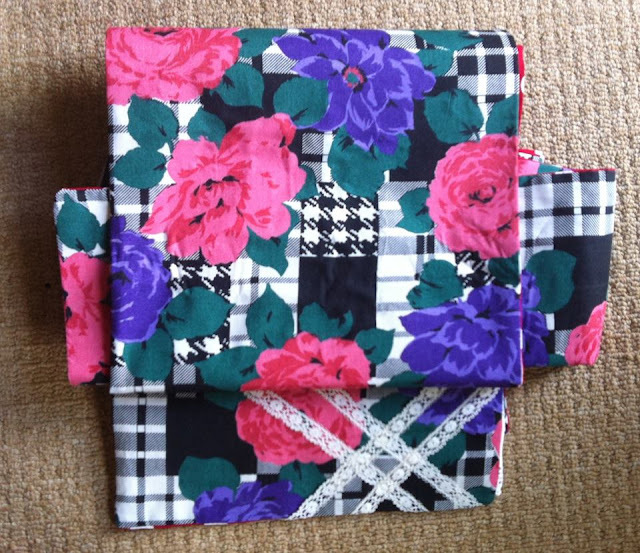 This weekend I've tackled making a reversible chuya obi. I found I like them the best, but since there are not that many of them online, and even then they are selling out like hotcakes, I figured making my own is the way to go. 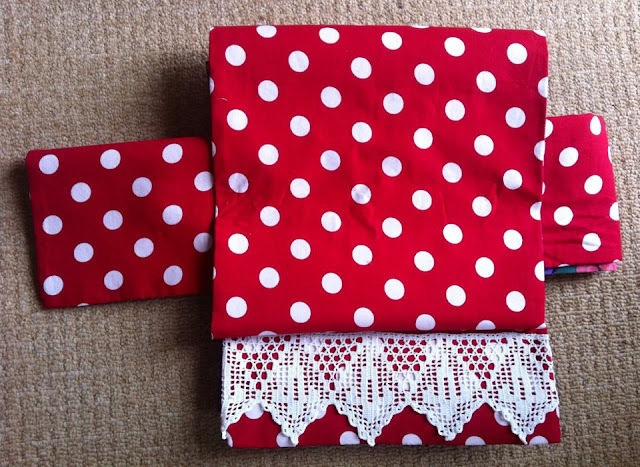 I had this red polka dot fabric laying around for a LONG time, but never really did anything with it. Silly me. The flowers side was a chunk of vintage cotton I got off ebay, so I don't have as much of it as I would have liked. I do love it though. I was hoping there will be enough to make 2 chuya obi, but alas. I do have enough for hanhabla, so whee!! So making obi is not exactly a rocket science, it's just a reaaaaaaally long rectangle but dang let me tell you by the end I was ready to throw it across the room! Imagine sitting there with 4 meters/13 feet of fabric full of pins on your lap, which constantly freaking pin you? And then trying to sew through 4 meters of fabric at one time, keeping a straight line? Or measuring it... Yup, suddenly making obi is not so easy, at least for me. Ok, so it's not really hard either, more like annoying since there is so MUCH of fabric! I've actually messed up on the bottom with measuring, that's why it's not really straight. I measured and double measured, but it still came out slightly different on each side. I'm actually not THAT bothered by it, because I know that when worn it won't be visible much, and if it is, I can just say I tied it uneven like that on purpose! I've also wanted to have some decorations on it, but since it's a chuya obi, I wasn't going to mess with it too much. So I opted for decorating the bottom part only, since it will be nicely visible when worn, and I didn't have to guess where to put the decorations to make sure it was visible. I had some vintage lace I bought a while back, so I set out to find the perfect one. For the flowered side I choose a thinner lace and just arranged it my favorite way, the striped of course. For the red polka dot side, I wanted some more ooomph since it's kinda plain on it's own, so I choose some hand crocheted lace there. I imagine it will stand out quite nicely when worn. I can't wait to wear these! Oh, I like this one! Especially the polkadot part with the lace. And yeah, I know what you've felt, I've recently sewn a kimono and got crazy already with the shorter seams there. I just wonder... What did you use inside the obi? Thank you :) I used regular thin fusible interfacing on each side of the obi. You might not think it (I didn't before), but that's actually enough :) The trick it to use interfacing of the same thickness as your fabric, maybe a little thicker if you want. If you use REALLY thick one, your obi will crease like crazy.